A new documentary premiering tonight (Feb. 13) on PBS promises to show the Earth as you've never seen it before ... from space. Produced by NOVA, the documentary "Earth from Space" explores how satellites and spacecraft have revolutionized how scientists look at the world and its intricate systems. Only by taking a satellite eye's view of the Earth can scientists studying the geology and climate of the planet gain a sense of just how interconnected the sea, land and air of the planet are, saidWaleed Abdalati, the director of the Earth Science and Observation Center run through the University of Colorado at Boulder and a participant in the two-hour documentary. "I think intuitively we know there are connections, but when you can actually trace dust storms off the Sahara to weather events in North America it changes things," Abdalati said. "The real power of satellite observations is that they represent objective truth," explains Piers Sellers, an ecologist and former astronaut, in the documentary. "They tell us about what the world actually is doing not what we would like to be doing, not what we might fear it to be doing, but what it's actually doing. And it's that that allows us to see change, real change for what it is." Visualization showing how charged particles stream onto the poles of the Earth creating the northern and southern lights as seen in the new PBS documentary "Earth from Space" by NOVA. NOVA senior executive producer Paula Apsell — the creator of NOVA scienceNOW, a popular science news program — and her team of filmmakers compiled images, video and other information from some of the 120 Earth-observing satellites in orbit today to make the new film. NOVA used information from the ocean monitoring Aqua satellite to use computer animation to show what water evaporating from the ocean at the Equator could look like. The filmmakers also utilized data from the polar orbiting NPP Suomi satellite to show how the ice caps have changed through time. While most Earth-observing satellites are still hard at work long past their expected life times, many of the Earth orbiters will need to be replaced in the next five or 10 years, Abdalati said. It's particularly important that these observations are continuous, Sellers added, because scientists need these satellites to see the broader view of the planet's unified systems. NASA's fleet of Earth-observers got an upgrade this week with the launch of a new Landsat Data Continuity Mission satellite that will replace a satellite that will be retired in the next two years. 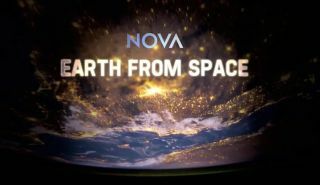 NOVA's two-hour documentary "Earth from Space" debuts Wednesday, Feb. 13, at 9 p.m./8 p.m. Central, on PBS (check local listings).